A Feature-Rich, Refund-Ending, Time-Saving, Help Desk System That Is So Easy To Use That You'll Quickly Tame All Of Your Customer Support Challenges! 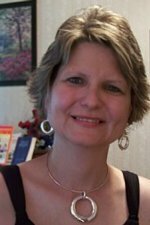 Designed especially for Internet marketers, bloggers, Ebayers, affiliate marketers,authors, and infopreneurs. And Even Turns A Profit...! Spend less time on your business, and make more money by providing high quality, professional service which creates long-term repeat customers! Hi, my name's Willie Crawford, and "I'm one of you." I know how busy running an online business can be, and I'm going to make it easier. Trust is a huge factor in selling online. If your visitors don't trust you, they'll NEVER buy from you. If you look like a reputable, professional company who cares about them as a customer, they'll happily whip out their wallets and buy whatever you've got. Business is hard, isn't it? It takes a lot of time and effort, and working on the web it's so easy to get distracted by any number of things. You need to be able to manage your time effectively, cut out as much fluff as you can and make every second count. Lastly, you need to be sure that everything you're doing will pay off in the long run. It's no good spending a week working tirelessly on something that won't pay the bills at the end of the month. Everything you do must lead to income in one way or another. That's it - the basics of presenting a unified, branded, professional and profitable image for your online business. » FACT #1: A happy customer is more likely to become a repeat customer. » FACT #2: Finding new customers is harder than serving your existing ones. Keep Your Current Customers HAPPY! 'Three Pillars' is a web based application that will enable you to run your own web based Support Desk, helping you to automate and centralize all your customer support duties, while getting the most out of every minute that you spend interacting with customers. Visitors can either find the answer to their question in your knowledge base of Frequently Asked Questions, or they can create a new specific support request and receive a ticket to track it's progress. NOTE: For users of the Rapid Actions Profits affiliate system, Three Pillars can be configured to open within the RAP control panel. Look around you. How many of the sites that you visit on a daily basis employ some form of centralized customer service system? How many "gurus" have their own help desk? The answer: they ALL do! Why? Because it's the best solution to a common problem. Customers will always need help and support with your products, and the best way to minimize the time you spend on this, and to maximize the effect of your dedicated personal support is to centralize it with a help desk system like 'Three Pillars'. If you don't have a help desk already you're wasting valuable time. Plus, you're not taking the chance to simply and easily deliver high quality personal service to your customers, which will improve their satisfaction and make them more likely to buy from you again! "... I'm very impressed ..."
I'm very impressed with your "Three Pillars Support Desk." Installation was quick and easy, and I had it up and running in no time. This will save me a lot of time and effort for sure! 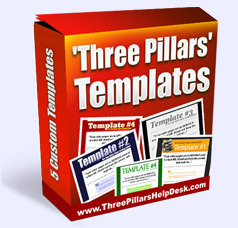 I created 'Three Pillars' after a long and fruitless search for a cheap and effective web-based help desk solution. They were either too expensive, badly put together, buggy, lacked important features I needed, were discontinued, created using arcane or obsolete technologies or just plain JUNK! Allows the user to enter their full name, email address, a subject for the ticket, their message and forces them to enter a CAPTCHA (all they have to do is read a few characters and numbers from a small image to prove they're a human - this stops SPAM bots in their tracks!). The ticket is created in the database and a Ticket ID is returned to the user, so they can come back to the site at any time in the future to check the status of their support request. Once the user enters their email address and Ticket ID, they can view the entire ticket history - their messages along with all replies from the administrator(s). Of course, they have the option to add a new reply to the ticket on this page. Give different people password protected access to different categories and different levels of your help desk. You decide who can read and respond to which help tickets. You decide who can change system configurations. You decide which drop-down "One-Touch Responses" each admin can use or edit. You decide which admins can add templated responses to which category, who can add to your FAQ, etc. The degree of customization you exercise just by checking boxes within your configuration setup will amaze you. These setting can be changed by the Super Admin at any time. Back and forth conversation can continue through unlimited cycles. All email notifications are optional and can be switched on or off from within the administration panel (see below). You can also define signature files to be added to both ticket messages and emails (hint: this is a great place for a promoting a pet project). The Knowledge Base is designed to save you time answering the same questions over and over. When you see a common theme appearing in the questions you're being asked, you can create a "Frequently Asked Question", or FAQ, that users will be able to view from the homepage. They can either view the mostly popular questions, or search to find the answers they need. Having this in place, and editable from within the admin panel, will save you a ton of time when launching new sites or new products, or even just with day to day support emails. So you can automatically promote multiple campaigns in your signatures without any extra effort. To help you allocate your time more effectively and deal with urgent or emergency support requests first. If you have several websites, products or services and you want to be able to separate each one's support requests (for example, if you have one member of support staff for each site), users can choose a department or category for their tickets. Each admin sees ONLY tickets in their assigned categories. No more difficult file editing or messing around with crazy SQL commands. Just browse to the install script, fill in a few details and you're done. 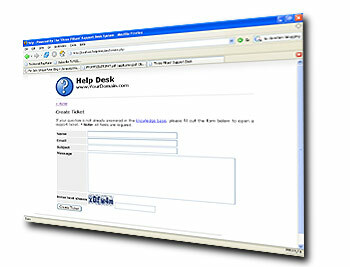 The Help Desk is entirely configurable from the web based settings panel. Database settings, admin passwords, admin category assignment, automatic email notifications and general configurations. You can also edit your sitewide signature from within this section. Your signature appears in emails and ticket replies. To add that extra professional touch, you can customize all email templates (including subject and message), plus you can use tokens to personalize messages to customers by dynamically including the recipient's name and Ticket ID. When logging into the admin panel, you are presented with a list of tickets. You can search through these for specific terms, or filter them by status - including viewing archived closed tickets. From within this section of the admin panel, you can add and delete FAQ entries, as well as being able to see how many times each entry has been viewed. This allows you to accurately assess the difficulties that your customers are having with your sites and products, since those FAQ entries will likely be viewed the most. It's also a great indicator of potential new products to solve those common problems! No more re-typing the same response over and over again. Simply enter it once into 'Three Pillars', and next time you answer a ticket your 'canned' response is only a few clicks away. A single click will add any support ticket to the knowledge base as a Frequently Asked Question. As soon as you notice a question is coming in a lot over a short period of time, a single click will make it instantly available for all your customers. If you want to cut down on the amount of email you receive, switch off the "on-open" notifications in the settings panel and simply leave the desktop notifier running on your desktop. Every time a new ticket is opened, you will be quietly notified so you can deal with it at your earliest convenience.
" FAQ Allows Me To Cut Down On Questions I Have To anwer Personally By At Least 70%..."
Last year I was on the lookout for a fully featured Helpdesk script that I could customise & I install myself. Yours was recommended to me, I bought it and it works just great. Having a web based helpdesk means I can log in and answer my clients questions whether I'm in the UK, on Crete or Ibiza! I especially like the FAQ database it allows me to build, as this cuts down on the questions I have to answer personally by at least 70%. I can even install it on multiple domains! Add to this your support and lifetime updates and I can't see me using any other helpdesk script ... '3 Pillars' does it all! Sounds good doesn't it? Imagine being notified the instant a new ticket is opened, and then being able to answer customer queries in as little as FOUR clicks! If I were a customer, I'd be pretty darn happy with that sort of service, wouldn't you? "... a quality support front-end ..."
I've used several helpdesk scripts in the past but found them clunky and bloated. I wanted something easy to use, easy to configure and most importantly, easy for my customers. Three Pillars provides all that in one easy to install package that enables me to run an efficient Helpdesk and provide a quality support front-end for my customers. "... a big burden lifted from my shoulders..."
I really wanted to let you know what I think of your Three Pillar helpdesk software. You see, I'd been literally struggling with providing customer support before your script. The script I had been using would only notify me of new support tickets about half of the time. And I really didn't want to camp out, manually checking my helpdesk every 10 minutes, day in and day out. So, when I installed your script and the notifier desktop software, it was like a big burden being lifted from my shoulders. I can't thank you enough for that. And customizing the old helpdesk script to fit my site, don't get me started on that! With your script, on the other hand, personalizing it was a breeze. quicker and easier without sacrificing that personal touch. Well, I could rattle on a lot longer about how much I like the script but I know you're busy so, thanks again and take care! It's not just a support desk.. it's the public face of your business, and it's your chance to deliver strong and consistent branding and professionalism, while saving yourself some serious time! 1) To be seen as professional by your customers. Having an automated, centralized, well designed and reliable customer support system projects the attitude that you're serious about your business, and just as serious about your customers. It shows that you're making an effort to be available to help them in their hour of need, and that you're not just a con man after their hard earned cash. 2) To be able to manage your time effectively. No more rummaging through countless emails from different email addresses. No more accidentally deleted or mysterious lost support requests. And now you won't have to constantly check your email or get distracted by customers taking up your time with the same question over and over. Just log into the support desk once a day, then quickly and easily answer all the questions that are still open. Assign specific categories to assistants who have their own unique log-ins, and effectively delegate certain areas of customer support. 3) To turn a profit on almost every action you take. A happy customer is more likely to spend their money with you again. You need to focus on helping your existing customers and keeping them as happy as possible, without taking up too much of your valuable time. There's also the signature files that you can include in all your messages - a fantastic place to slip a quick affiliate link or two to maximize every possible income stream! Now before I go any further, I'd like to thank you for reading this far. I know I've had a lot to say, but you've stuck with me, and I appreciate that. Before you check out the special deal I've got for you, I want you to check out the demo site showing 'Three Pillars' in action. Click here to view the demo site, and click here to login to the admin panel - the admin username and password are "demo" and "demo." Your new Help Desk doesn't have to be only used for support requests. You could use it to track your JV partnerships and promotions, personal communications, scheduling with outsourcing partners... the list is endless. "... cut support time by 50%! ..."
As soon as I saw 3 Pillars, Oli and I knew that it was going to be a better way of supporting our users than either email or forum. We've been using 3 Pillars on www.wpsmart.com for a few weeks and are very happy to say that all of our users seem to love the simple yet extensive Ticketing and FAQ interface. The FAQ has cut support time by at least 50% which allows us to concentrate on making more sales - always a good thing! You get far less email in your inbox since it all goes through the Help Desk. It cuts out the huge spam problem that the Web has (thanks to the CAPTCHA technology on the "Open ticket" form). It's a heck of a lot easier to manage a dozen things at once if they're all going through the same system! Now you don't have to set up a new email account each time you launch a new site. Nor do you have to check 15 or more different inboxes every day to make sure you stay on top of incoming support requests or pre-sales questions. Just log in to the helpdesk, and everything is a few clicks away! I want to make this package really special for you, and I want you to be absolutely happy with your purchase (remember the three pillars? :)). So, when you purchase today I will throw in a bonus package of 5 unique, custom designed templates that you can use with 'Three Pillars' to knock the socks off your clients! These 5 templates are all original and come with complete XHTML templates, all graphics and all Photoshop PSD files so you can edit the text in the headers. If you don't want to keep the default template provided with Three Pillars, just upload all the template files to your helpdesk, and it's done! 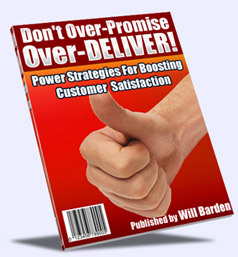 I will also throw in a free copy of my short report entitled "Don't Over-Promise, Over-DELIVER!". This is one sales and marketing tactic you don't hear about very often from the "gurus", but believe me they're all working hard to do it! This report covers what not to do when planning your product offers, and also exactly what you SHOULD do to make sure your customers are as happy as they can be. Over delivery is something all salesmen should strive to do - a customer who has received more than they expected is a) more likely to buy again, and b) highly likely to rush off and tell their friends about the fantastic offer they just got. Wouldn't it be nice to have your own army of salesmen, working for free? Everything you need to train your own is right here in this short report. Free Lifetime Upgrades. We use Three Pillars HelpDesk ourselves, and are constantly looking for ways to improve the software. When we do upgrade the software, the upgrades are written to be installed easily on top of existing installations. When you purchase and register the software, we will notify you any time that there is a free upgrade available. Registering the software also allows us to easily replace your copy should you ever require that. When you purchase 'Three Pillars' you are protected as a consumer by our 90 day money back guarantee. If you are unhappy with your purchase, please contact me and I will do everything I can to make you happy. If it turns out Three Pillars doesn't suit your business, you are entitled to a full refund, no questions asked within those 90 days. Grab your copy of 'Three Pillars', install it, try it out and see how much time and effort you save. If you don't save a ton of time or feel that the extra professionalism you now exude was worth the money, I'll refund your purchase, simple as that. Having a customer support system is one of the ground rules of Internet Marketing that almost no-one talks about, but what's the famous rule of thumb when we're talking about "gurus"? "Do as they DO, not as they say..."
It saves time and makes answering customer support requests a breeze, and could even turn into a nice little profit center for you! When you've got a dozen or more websites in the near future, or if you've got that many now, wouldn't it be nice to only have a single virtual "in box" to check for all your customer support queries? Wouldn't it be nice to be able to answer support requests in as little as FOUR clicks? Think how much time you'd have to spend on more productive areas of your business, and think how happy your existing customers are going to be. Remember - a happy customer is a repeat customer! Wouldn't it be nice just to have more family time - because by finally getting organized, you suddenly have more free time? Download your copy of 'Three Pillars' now (this is the cheapest it's EVER going to be! ), and be up and running in a matter of minutes. You can access the product via a secret download page immediately after your purchase. * Regular price now $147. This is special "recession buster" offer. The price will go back to $147 shortly. Get your $50 off by clicking the link below to order now. If you check back tomorrow... and it's back and $147, don't say that we didn't warn you. P.S. - Having a help desk isn't just the latest fad, or the hottest viral thing-ummy-jig, or even the latest "groundbreaking guru secret". It's smart business. The 'Three Pillars' are here to stay. They're a fundamental part of running a successful business, and a support desk is essential. If you want to be successful in the long run, order your copy now, and invest in your business future. Installation takes just a few minutes. You can have your brand new helpdesk up and running in less than 10 minutes from now. Use it for a few weeks, and if you're not totally delighted, simply ask for a refund. Order now, you won't be disappointed! "... had it operational in less than 30 minutes... included setting up a new domain"
I bought The Three Pillars help desk system, installed it, customized it, and had it operational in less than 30 minutes! Very impressive...(That 30 minutes included setting up a new domain - http://www.HowCanDavidHelp.com). The easy-to-follow, no-fluff installation guide was perfect! I'm already very happy with this system. In less than 5 minutes, I had 20 different categories of product support setup and tested the system. Willie, this thing is really going to solve a lot of problems for me. Like you and nearly every other marketer on the planet, I get hundreds of emails every day! Losing support emails in that mess is like playing Russian Roulette with my customers. It was only a matter of time before I had some very angry customers. But with The Three Pillars help desk system, I'm able to respond to these important requests immediately, while helping my customers see that they get only top-notch service from my business. I had only one complaint/suggestion about the software, I thought...but after I sent the suggestion to you, I discovered that you had already anticipated my suggestion and implemented it. I'm so happy I can finally automate AND improve my support communications with this system. "... being able to know WHEN a new message comes in is extremely helpful"
I just HAD to tell you how much I've enjoyed using my Three Pillars Help Desk! Responding to my buyers and subscribers in a timely manner is very important to me, so being able to know WHEN a new message comes in is extremely helpful. I love that feature! The one-touch answers section really helps to speed things up too. I can't imagine why anyone would want to use a different help desk software! Thanks for a very useful product! I'm looking forward to your next one. You seem to know exactly what busy marketers like me needs! "Willie, that sure is nice help desk software." "... the Three Pillars Helpdesk System has helped me gain an unfair advantage "
Just wanted to drop you a note to say Iâ€™m really pleased with Three Pillars Helpdesk System. And the life-time guarantee won me over immediately! It is true that every marketer should use a helpdesk system to manage their online business and support their customers efficiently and effectively. In fact, superior customer service IS a key differentiator in todayâ€™s competitive online environment â€“ and the Three Pillars Helpdesk System has helped me gain an unfair advantage online i.e. the WOW factor. "The features are everything you could ask for..."
After trying out several helpdesk systems I stumbled upon "The Three Pillars Helpdesk" and spent the rest of the day changing all my sites over to this system! The features are everything you could ask for, it looks great and is easily editable to your site's design and the best part - it works, every time. My company is now more professional, more organized and my time on support is now optimized with this highly recommended tool. "... especially like the desktop notifier... so I can be notified immediately of an issues"
I have to say I am sorry I didn't find out about your system first! Before finding your three piller help desk system I used another solution that was nothing but problems from the get go and lacked support for their software to say the least. Your system has just the right features needed to quickly and effectively support my clients. It was quick and easy to install and I had it in place and ready for service within 15 minutes. I especially like the desktop notifier software that comes with it so I can be notified immediately of an issues as soon as they are submitted. I highly recommend your help desk system and give it my "Best Damn Seal of Approval"
"... better than any $1,000 dollar system ..."
â€œAs my business grew I had the problem of what helpdesk ticketing system to use. I eventually found something that I believe is better than any of those $1,000 dollar systems which often aren't intuitive for customers to use and will crash anyway! "... going to save me no less than 4 hours a day"
I installed Three Pillars Helpdesk this morning and just had to drop you a note to tell you how much I love it. I've been like a kid with a new toy all morning! on to a perfect install. The whole process, including my mistake, took less than 30 minutes! And this was on HostGator, too! I get on the average of 300 emails an hour now, which is low campared to you, but still I have to constantly stay on top of it to keep it manageable. Once I get people trained to use the helpdesk rather than email, it's going to save me no less than 4 hours a day sifting through junk to find the few messages I really need to see. My hat's off to you for creating such a fantastic time saver and a near perfect solution to junk e-mail! 'Three Pillars' requires a PHP 4 (or above) enabled web server with access to a MySQl 4.0.27-standard (or above) database. This software is for personal use only. You may not resell, rebrand, redistribute or republish any of the material provided in the package. The license you are purchasing entitles you to unlimited installations of the software on your domains ONLY. No warrantees or guarantees of income or fitness for purpose are made, and the author accepts no responsibility or liability for any direct or indirect damages of any kind resulting from use or abuse of the product. Copyright © 2007-2009 Willie Crawford Inc.